DUBAI, United Arab Emirates—Diego Maradona was fined 9,000 dirham (US $2,450, €1,901) on Thursday by the United Arab Emirates Football Association for verbally abusing a rival coach. Maradona, who coaches UAE club Al Wasl, has been feuding with Al Ain coach Cosmin Olaroiu since losing an ill-tempered match last month. The 1986 World Cup-winning Argentine complained that Olaroiu and his staff celebrated the winning goal in an unprofessional manner. He later called Olaroiu rude and impolite and suggested it was the club's players, not Olaroiu, who deserved credit for its early season success. Olaroiu, a Romanian in his first year at Al Ain, told reporters that Maradona's criticisms came from someone "who doesn't have a clear mind," a reference to the Argentine's history of drug and alcohol abuse. Olaroiu was not sanctioned over the comments because Al Wasl hasn't filed a complaint. In its verdict, the FA disciplinary committee also cautioned Maradona and took him to task for calling Olaroiu "impolite." The committee dismissed a separate complaint filed by Al Wasl, which accused Al Ain fans of pelting its supporters with stones after the match. Al Wasl officials could not be reached for immediate comment. Al Ain Chief Executive Carlo Nohra said Maradona's sanction was justified and sent a message that such conduct would not be tolerated in the league. "We are happy a decision has been taken in this case," Nohra said. "This was never really about Maradona but curbing coaches behavior toward one another. We all felt this behavior should have been picked up by the league anyway." Since arriving in Dubai, the brash and colorful Maradona has made his presence felt. He has repeatedly criticized referees he claims were biased against his club and at one point suggested they should focus more on the match than trying to become celebrities. He also kicked a fan for intruding on a photo shoot he was trying to take with a banner of support from his grandson. "As a surprise from my daughters in Argentina and Manchester, they put a sign up for me in the ground that read: 'Grandfather, I'm with you. I love you. Benja,'" Maradona said after the incident. "I'd like to apologize to one of the fans. I was trying to unfurl and see the whole banner and, by mistake, I perhaps injured him." On Wednesday, the 50-year-old Maradona defended his criticism of referees, and said they could benefit from his vast experience. 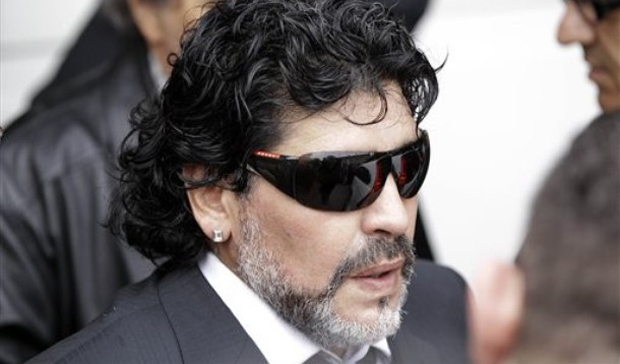 "I only say what I feel," Maradona told a news conference. "In the future, they will realize what I said was right. I have 35 years in the industry and that has made me realize certain things." Maradona retired as a player in 1997, but battled weight problems and an admitted cocaine habit even before he left the game. He turned to coaching in 2008, taking over at Argentina and leading his country to the World Cup quarterfinals in South Africa. He was fired after the World Cup and joined Al Wasl in May. Throughout his career, Maradona has never been shy about courting controversy. In 2009, he was handed a two-month ban by FIFA from all football activities for expletive-filled rants after his team qualified for the 2010 World Cup. He also has had a running feud with Pele, recently saying the retired Brazilian star must have taken the "wrong medication" when he suggested Neymar was better than Lionel Messi.